Built in Germany and built to last, the labcycler combines high performance peltier blocks with the flexibility of rapid block exchange to meet your changing work requirements. The latest TripleBlock allows three independent assays to be performed on the one instrument at various times. The labcycler has processor controlled blocks with separately controlled peltier elements for extraordinary temperature homogeneity at high heating and cooling rates. State-of-the-art peltier elements have demonstrated more than 600000 cycles so far without any failures. This equates to more than 15 years of lifetime even under the most demanding conditions, like DNA-sequencing on a daily basis. Two labcyclers can be connected with a RS232 null modem cable. This allows simple copy of programmes or the directory from one device to another. 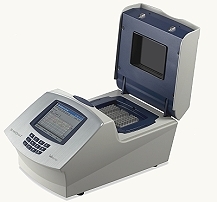 The instrument is available in two forms: the labcycler Basic and Gradient – both are compatible with all the rapidly interchangeable blocks.